Illegal Immigration – let’s solve it! 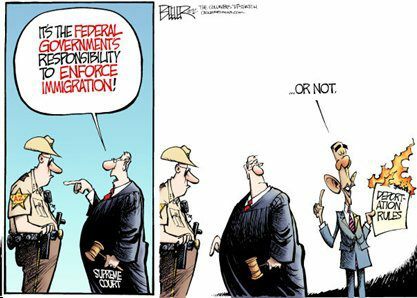 Yes – ILLEGAL Immigration. Stop calling law breakers immigrants, they are illegal aliens. That said, politicians seem unable to solve the problem. Illinois spends billions on illegals because following the law isn’t an option, much like the rest of what happens in Illinois. Because the elected are intimated, politically correct, or just plain weasels – citizens are forced to form policy for them. Let’s have a discussion! Secure the borders. I don’t care how, how much it costs, what it looks like, or who files briefs opposing it – either America is a sovereign country or it isn’t. The status of anyone here illegally does not change until the border is secure. “Secured borders” means to the standards of citizens, not to the standards of politicians. This means no possible way of sneaking in to stay. Land deemed unfit for tourism because of drug cartels is not acceptable to Arizona or the rest of the country. Deportations should continue until the border is secured. Accelerating the pace would probably get the border secured sooner. Illegals here now who crossed the border after turning 18, have NO path to citizenship ever. They broke the law. In almost every other country they would be in jail! This country can not reward law breakers. They must work with an assigned social security number designating them as a guest worker. They are not eligible for welfare, food stamps, public housing, or any other benefits from the government. They will not be eligible for tax credits which provide income above the taxes paid. Chain migration is not allowed. Illegals will NEVER have the right to vote. Illegals will pay into the social security system, but they will NEVER be allowed to collect social security. Consider it a penalty for breaking the law. They must be deported if convicted of a felony. The only path to citizenship is leaving the country and applying to enter. Applying for a guest worker social security number is mandatory, even if they don’t plan on working. Think if it as “registering” with the government. Failure to register qualifies for deportation. If a Constitutional Amendment to this effect is needed, let’s do it. Enough of the pandering from politicians unwilling to take a stand. If all conditions are met and they desire to be citizens of the United States, they can apply and be fast tracked at age 25. The age is strictly arbitrary, we can’t punish the kids forever for the crimes of their parents. Posted in Local.Tagged aliens, BloNo, illegal, immigration, Pantagraph, WJBC. Through illegal aliens America has experienced the largest increase in foreign labor and the largest expansion of social welfare programs in history! A major burden has been placed on our already weakened/overloaded education, healthcare, and welfare programs. Illegal aliens are drastically hurting every man, woman, and child in the US. Do you consider the cost of $18,000/illegial alien as being cheap labor? Maybe it is cheap labor for the person hiring these individuals, but this is costing the American taxpayers over $338 billion dollars annually—enough money that would definitely stimulate the economy. What are we teaching these illegal immigrants, that it’s OK to do something wrong and get by with it? I don’t understand why we currently are providing welfare and educating these illegal aliens—it’s no wonder more keep coming! In 20 years, the current US citizens will be in minority. Roy Beck from NumbersUSA has some excellent points and offers a great education on immigration in his gumball presentation that is called “Immigration, World Poverty, and Gumballs” and can be viewed at http://www.youtube.com/watch?v=LPjzfGChGlE . Supporting illegal aliens is totally Anti-American and to look the other way when many of your fellow Americans are desperately hurting for employment, for healthcare, and for education, and to rob America to help support someone who is breaking the law when many of these people have not been supporting our country while they have been living here. They have sent money back to their families, have flown our flag upside down and have not been appreciative for what they have received from the American citizens, instead they want more. I absolutely don’t understand this. I do not consider even the children of those families be given amnesty or some type of pass into America. They can consider themselves being very fortunate to be given a free education, free healthcare, and free welfare while living here. We have treated many of them better than those who are US citizens! With over 85% of college graduates moving back home because they can’t find a job or obtain a job that will support them living on their own and with less than half of employers (44%) hiring new college grads and with an unemployment rate of 8.2% —why would we want to add to these depressed statistics? Now it’s time for all illegal aliens to go back to their own country and they can help improve the standards there instead of bringing down America!